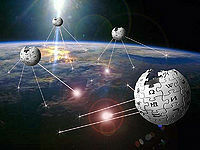 The Plague of Wikipedia, or "Wikiplague," is almost certainly the most heavily-visited, and also the most deadly, plague in the history of the Wiki Universe. Because it is "the plague anyone can edit," countless millions of mutations, adaptations, and permutations have been created, making conventional treatments almost completely ineffective. Since its initial outbreak approximately 1.34984 billion years after the Big Bang, this plague has killed approximately 250 Billion people, 45 kittens, and a yak. It is also thought to be responsible for the disappearance of your car stereo in 1983. The devastating effect of the Wikiplague can been seen above this poor, innocent planet that did nothing whatsoever to deserve total annihilation, as seen here. While most life forms on Earth evolved from small, slimy globs of goo into large, pulsating lumps of puddy, the Wikipedia virus slowly developed into a devastatingly infectious contagion that swept mercilessly throughout the planet. It spread from piece of toast to piece of toast, from jam tart to jam tart, from cranberry scone to cranberry scone, occasionally stopping for a bit of scrambled and a nice cup of tea. After roughly 3 years of inflicting suffering and misery on the human population, Wikipedia asked itself: "What the hell am I doing here?" This looks very convincing.... Nope. Not the Wiki-Overmind. Meanwhile, this abominably evil plague continues to spread at an astonishing rate. The final phase of its insidious, mind-numbing, soul-destroying campaign of mass destruction has already begun. Websites such as Uncyclopedia can help you defend your mind against brainwashing, but even Uncyclopedia may not be enough to stop the relentless Wikiplague juggernaut. The so-called Overmind, said to be the self-aware control center of the Wikiplague, is the source of its expanding power. It has effectively stopped ordinary people from destroying it by removing perfectly worthwhile information about the emo band I started last week, and by recognizing and blocking the IP addresses of brave, courageous "editors" who attempt to put the information back in every 5 to 10 minutes. The Overmind has also infected 200,000,000,000,000,000 pot-pies which could have been better used as missiles for throwing at your neighbour's cat), but instead are now being used as fuel for a massive fusion reactor which serves as an energy source for its hydraulic flux-capacitor resuscitation system. As the Overmind grows and mutates, it constantly searches for new energy sources, such as other galaxies. It has already consumed nearby galaxy Andromeda, as well as several "celebrity" galaxies such as the original Star Wars movie-set galaxy and the CGI-based Avatar-in-3D galaxy. In addition, we suggest that a high degree of caution be used when purchasing small goods from your local Taco Bell. This is the 138th Annual Wikipedia Worshipping Event. This draws idiots from all over the world who desperately want to become unpaid "writers." In many parts of the world, Wikipedia has already recruited thousands of people to do its evil bidding, and has brainwashed them into worshiping it (mostly with annoying TV infomercials, usually broadcast on local cable channels between 2 AM and 4 AM). Those mind-raped by the Overmind are forced to lay down before it and chant, "Oh almighty powerful Wikipedia, we rely on you for all of our general reference information needs; make us worthy of ascension into the glorious halls of adminship," among other strange ritual incantations. Every year, thousands of "Wikipilgrims" gather for Wikimania, the massive annual Wikipedia conference, which resembles nothing more than a gigantic mosh-pit filled with decaying, coagulating brain matter. People lay down and mutter inane article ideas to their Wikipedia "god" for 48 hours or longer, without rest, refreshment, or potty breaks. Everyone then dances to some Stevie Nicks "music" — along with flavorless punch and rancid pie. This event, usually held somewhere in India, has been cited as the world's most concentrated source of greenhouse gas emissions, due to the enormous amount of hot air produced. 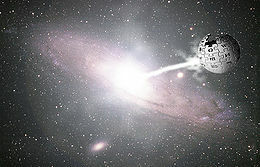 As seen in this 2001 space-telescope photograph (right), Wikipedia grew so large in the Andromeda galaxy that its own internal energy consumed it, causing it to collapse onto itself and form a super-massive black hole which astronomers quickly named "Jimbo." Before putting out your garbage, think. Is this really my garbage? And then: Is this really my apartment complex? Don't just throw old packets of chips in your shopping trolley. Try throwing in a few new ones too, for freshness. Whether Wikipedia uses its accrued power to destroy you or make you worship it as a God generally depends on what mood it's in that particular day, and how much money you have. The Overmind has been notably quoted as stating: "Your weapons are useless against our awesome power; resistance is useless; lay down before us and lament the loss of your souls." Of course, any attempt at resistance will be met with immediate annihilation for your entire planet, and as a result, everyone will hate you. 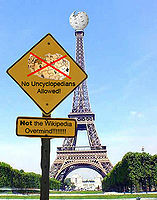 They won't hate Wikipedia, though - ohhhh, nooooooo. That would be too easy. Who knew that whipped egg and animal fats could save the Earth? Not you, obviously. A recent and somewhat popular theory suggests that mayonnaise may be the key to stopping the maniacal Wikipedia pestilence. Carefully-controlled scientific experiments have shown that a sufficient amount of the substance can actually reduce the spread of Wikipedia by as much as 7.8 percent. 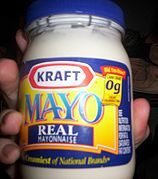 For some reason, the egg texture and animal fats in mayonnaise interact chemically with the contagion, with effects similar to those produced by spreading caustic drain openers on baloney sandwiches. Mayonnaise has already been tested on Jupiter against the Jovian Wikipedia site, and has proved ever so successful. d) Skip the letter "g"
Wikipedia landing on Earth. Once cracked open, as seen here, the infection quickly spreads until it is completely out of control. Before destroying Wikipedia, first tackle an even more pressing problem on Earth: Global Warming. To end global warming, have everyone turn on their air conditioners at the same time, starting at roughly 3:00 PM tomorrow. This should cool the planet down to its normal temperature. Now, on to Wikipedia. To stop the invasion, delete every article on the entire website, even if it means having your IP address blocked multiple times. (Try using an internet cafe, so that you'll have plenty of different IP addresses.) Then, go strangle some cats if it makes you feel better, you sick cat-killer. The infection has already begun. This page was last edited on 30 May 2012, at 06:20.